Come and join us for an evening of good old Somersetshire fun! So come on down to one of the best skittle alleys in Frome and join in the ultimate warm up gig; no specific teams required as we'll be playing 1 on 1 - and those die hard players can even stick around for a game of 'killer' at the end and a chance to win the kitty! Tickets are £10 (plus booking fee) and can be booked on Eventbrite. 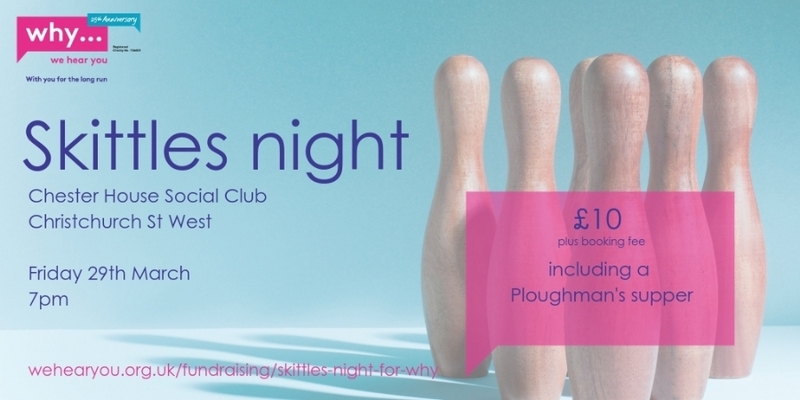 Entry price includes a delicious ploughmans supper and a whole night of great fun, laughs and competition! All monies raised will directly fund our free professional counselling service for children and adults affected and bereaved by life threatening conditions in your community.